When it comes to pumpkin, most of us have a pretty simple policy: the more, the better. Unlike store-bought products, these homemade pumpkin bars are as natural as can be, free of gluten, dairy and refined sugars so you can forget about all that guilt. 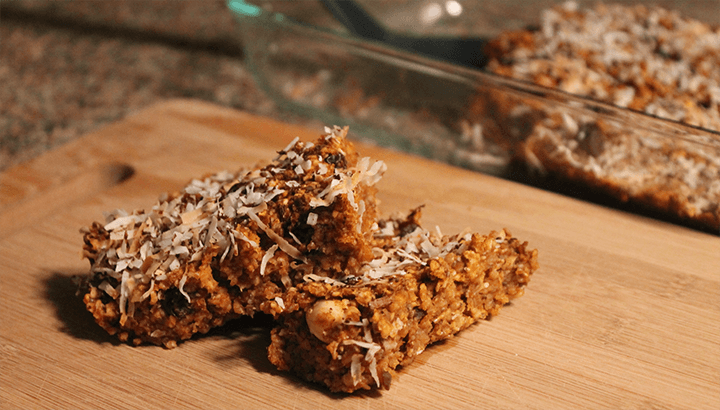 These land somewhere between pumpkin pie-flavored granola bars and chewy oatmeal raisin cookies. 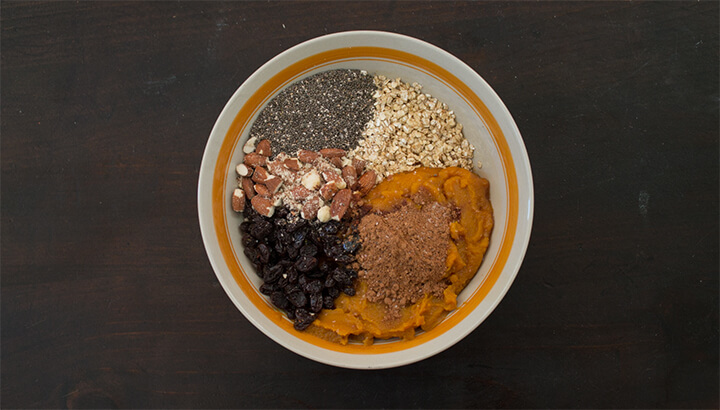 The pumpkin will load you up with beta-carotene and fiber to keep you full between meals. 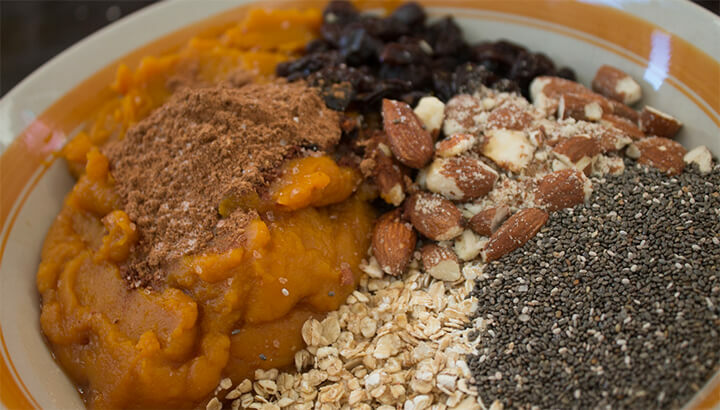 The almonds will give you a kick of protein and help lower your blood sugar. The oats will pump antioxidants into your system and prevent the formation of LDL (“bad”) cholesterol. The chia seeds will deliver healthy fats and nutrients to your body while promoting smooth digestion. That’s a whole lot of goodness is one recipe! 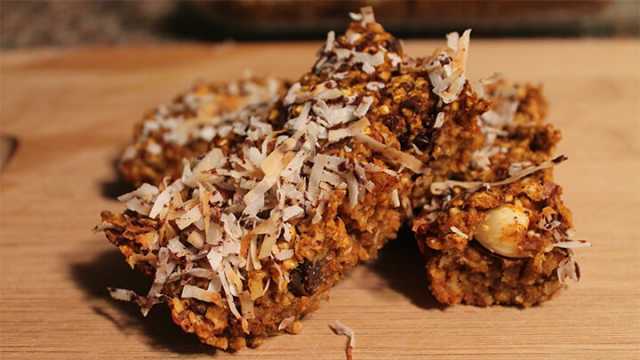 Try these pumpkin oatmeal bars for a quick breakfast on-the-go or just before a workout for a natural boost of energy. If you’re feeling that 3 p.m. slump, these bars can give you the much-needed pick-me-up you’re looking for, without that pesky sugar crash later on. For a touch of sweet flavor, this recipe contains pure maple syrup. Feel free to add more as needed, though keep in mind that every tablespoon of pure maple syrup contains roughly 14 grams of sugar. So, even though it’s a natural source of sweetness, you still want to use it in moderation. 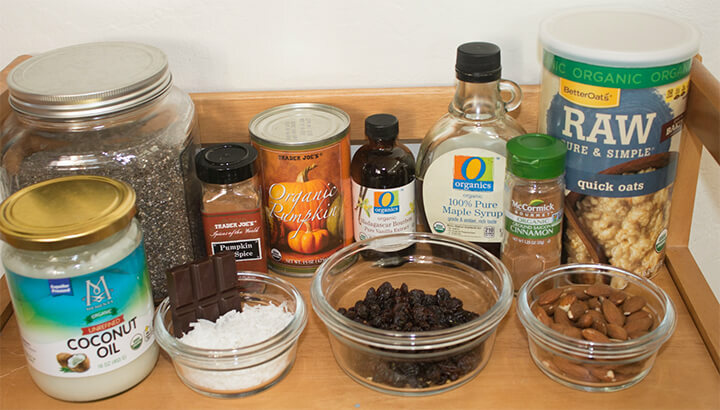 If you don’t have any pure maple syrup on hand, there are plenty of other natural alternatives that you can substitute, such as coconut sugar, dates, stevia or raw honey. 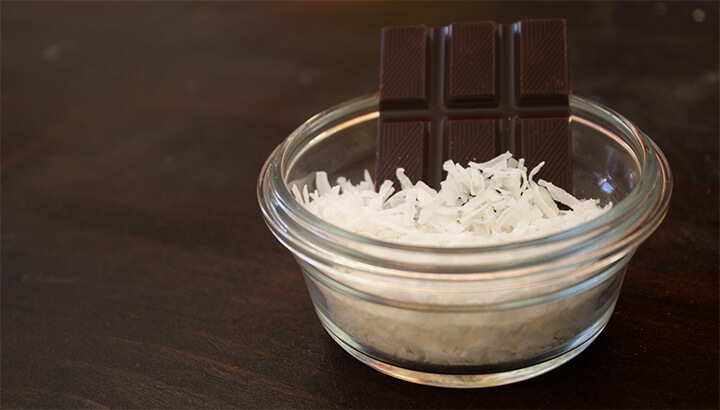 The coconut shavings and raw dark chocolate are optional, but I recommend using them for an additional boost of flavor and sweetness. Make sure to take into account that not all chocolate varieties are gluten-free, refined sugar-free or dairy-free (if that’s what you’re going for). As always, it’s best to check the label beforehand. And remember, try to use organic ingredients where possible. 2. Lightly coat glass baking dish with a layer of coconut oil. 3. Slice or crush almonds, if needed. 4. 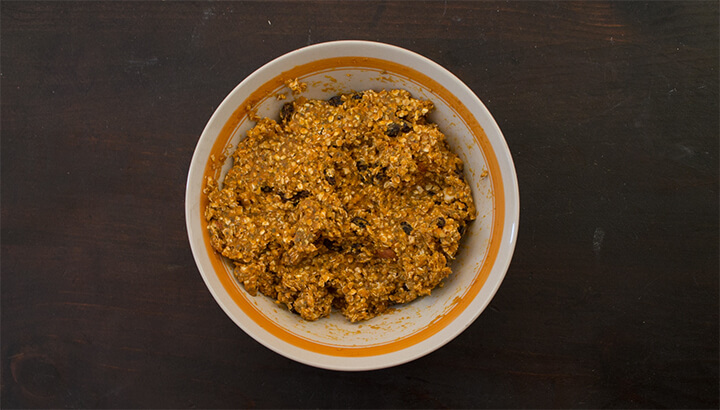 Pour quick oats, pumpkin puree, maple syrup (or natural sweetener of choice), raisins, almonds, vanilla extract, pumpkin pie spice, chia seeds and a pinch of salt into a bowl. 5. Combine ingredients until evenly mixed. 6. Press mixture evenly into glass baking pan. 7. Sprinkle coconut shavings over the top of the mixture. 8. Using a cheese grater, add a light layer of chocolate shavings on top. 9. Bake for 20 minutes. Coconut should look toasted. 10. 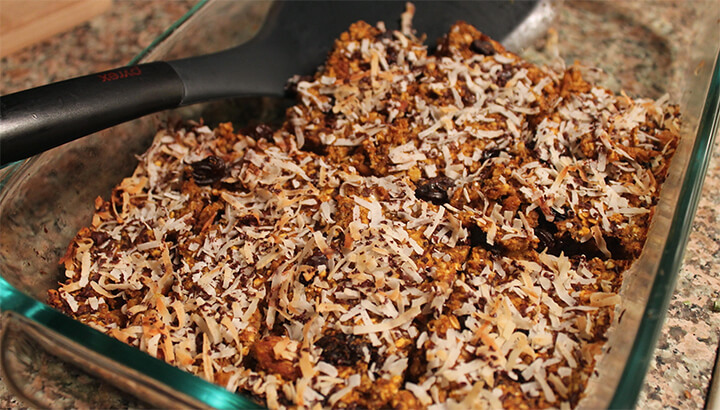 Wait for mixture to cool, then cut into granola bar-sized rectangles. 11. When you’re ready to eat these healthy pumpkin treats, heat them up in the microwave for 10 to 15 seconds. You’ll get that chewy oatmeal cookie effect, like it’s straight out of the oven. You can store these in the fridge for a week or two, but good luck trying to keep your family away from these for that long! 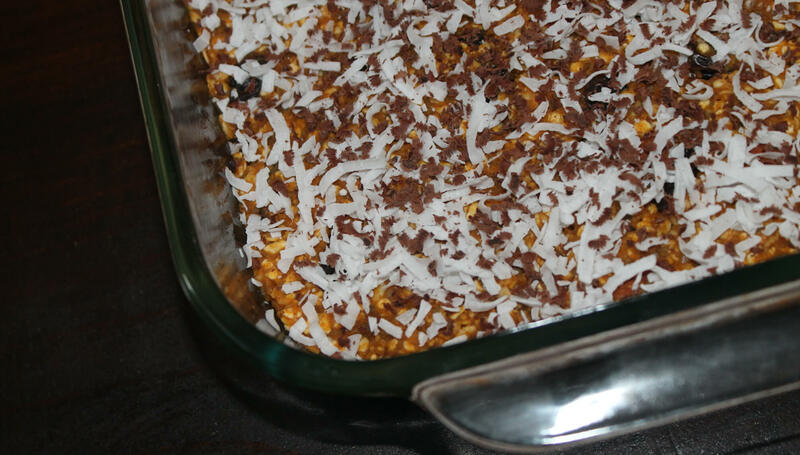 Hey Buddy!, I found this information for you: "Guilt-Free Pumpkin Oatmeal Bars". 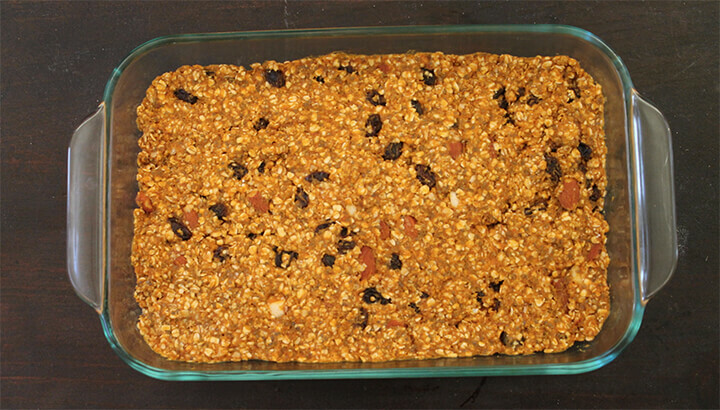 Here is the website link: https://www.thealternativedaily.com/homemade-pumpkin-oatmeal-bars/. Thank you.